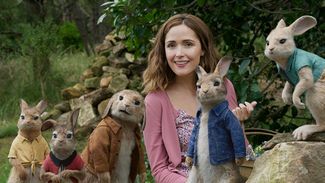 Peter Rabbit, the mischievous and adventurous hero who has captivated generations of readers, now takes on the starring role of his own cute, contemporary comedy with attitude. 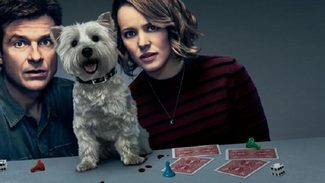 In the film, Peter’s feud with Mr. McGregor (Domhnall Gleeson) escalates to greater heights than ever before as they rival for the affections of the warm-hearted animal lover who lives next door (Rose Byrne). James Corden, with playful spirit and wild charm, voices the character of Peter. Vitals: Director: Will Gluck. Stars: Rose Byrne, Domhnall Gleeson, Daisy Ridley, Elizabeth Debicki, Margot Robbie, James Corden. 2018, CC, MPAA rating: PG, 95 min., Family, Box office gross: $113.277 million, Sony. Extras: “Shake Your Cotton-Tail Dance Along,” “Mischief In the Making.” Blu-ray adds “Flopsy Turvy” mini movie featuring Peter’s precocious sisters, Flopsy, Mopsy and Cotton-tail, narrated by Margot Robbie as Flopsy. When Flospy sets out to prove that anything her sisters can do, she can do better, she soon learns that when times get tough, sisters come together. Inspired by true events. On an isolated stretch of land 50 miles outside of San Francisco sits the most haunted house in the world. 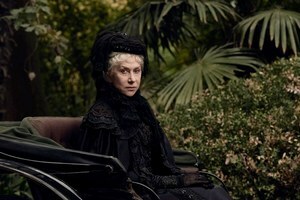 Built by Sarah Winchester, (Helen Mirren) heiress to the Winchester fortune, it is a house that knows no end. Constructed in an incessant twenty-four hour a day, seven day a week mania for decades, it stands seven stories tall and contains hundreds of rooms. To the outsider it looks like a monstrous monument to a disturbed woman’s madness. But Sarah is not building for herself, for her niece (Sarah Snook) or for the brilliant Doctor Eric Price (Jason Clarke) whom she has summoned to the house. She is building a prison, an asylum for hundreds of vengeful ghosts — of people killed by the Winchester rifle — and the most terrifying among them have a score to settle with the Winchesters. Vitals: Director: Peter Spierig, Michael Spierig. Stars: Helen Mirren, Jason Clarke, Sarah Snook. 2018, CC, MPAA rating: PG-13, 99 min., Horror-Mystery, Box office gross: $24.953 million, Lionsgate. Extras: “Driven by the Spirits: The Making of Winchester” featurette. Believing they have left behind shadowy figures from their past, newlyweds Christian (Jamie Dornan) and Ana (Dakota Johnson) fully embrace an inextricable connection and shared life of luxury. But just as she steps into her role as Mrs. Grey and he relaxes into an unfamiliar stability, new threats could jeopardize their happy ending before it even begins. Vitals: Director: James Foley. Stars: Jamie Dornan, Dakota Johnson, Eric Johnson, Rita Ora, Marcia Gay Harden. 2018, CC, MPAA rating: R, 105 min., Drama, Box office gross: $99.229 million, Universal. Extras: Deleted scene, “The Final Climax” behind-the-scenes featurettes: “The Wedding,” “Honeymoon: Travel,” “Mr. & Mrs. Grey,” “Ana Takes Charge,” “Ana & Mr. Hyde,” “Aspen in Whistler,” “Ana’s Revelation,” “Resolution,” “The Meaning of Freed.” Blu-ray adds “An Intimate Conversation with (author) EL James and Eric Johnson,” three music videos. Marvel Studio comic hero follows T’Challa who, after the death of his father, the King of Wakanda, returns home to the isolated, technologically advanced African nation to succeed to the throne and take his rightful place as king. But when a powerful old enemy reappears, T’Challa’s mettle as king – and Black Panther – is tested when he is drawn into a formidable conflict that puts the fate of Wakanda and the entire world at risk. Faced with treachery and danger, the young king must rally his allies and release the full power of Black Panther to defeat his foes and secure the safety of his people and their way of life. 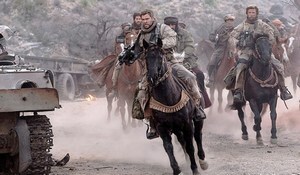 Third biggest movie of all time domestically with over $665 million – the first film in eight years to spend five weeks at No. 1 – and rising to the global top 10 of all time with over $1.3 billion. Vitals: Director: Ryan Coogler. 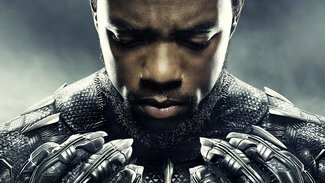 Stars: Chadwick Boseman, Michael B. Jordan, Lupita Nyong’o, Danai Gurira, Martin Freeman, Daniel Kaluuya, Letitia Wright, Winston Duke, Angela Bassett, Forest Whitaker, Andy Serkis. 2018, CC, MPAA rating: PG-13, 134 min., Action-Adventure, Box office gross: $666.272 million, Disney. Blu-ray extras: Director’s intro; “From Page to Screen: A Roundtable Discussion” delves into the film’s making; “Crowning of a New King” explores the world of “Black Panther” in all its color and complexity; “The Warriors Within”: the Wakanda’s women and the actors who portray them; “The Hidden Kingdom Revealed”; “Wakanda Revealed: Exploring the Technology”; deleted scenes; gag reel”; exclusive sneak peek at “Ant-Man and The Wasp”; “Marvel Studios the First Ten Years: Connecting the Universe”; director’s commentary. The real-life story of three men whose brave act turned them into heroes during a high-speed railway ride. In the early evening of August 21, 2015, the world watched in stunned silence as the media reported a thwarted terrorist attack on Thalys train #9364 bound for Paris—an attempt prevented by three courageous young Americans traveling through Europe. 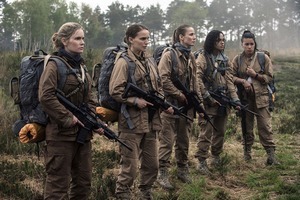 The film follows the course of the friends’ lives, from the struggles of childhood through finding their footing in life, to the series of unlikely events leading up to the attack. Throughout the harrowing ordeal, their friendship never wavers, making it their greatest weapon and allowing them to save the lives of the more than 500 passengers on board. The heroic trio is comprised of Anthony Sadler, Oregon National Guardsman Alek Skarlatos and U.S. Air Force Airman First Class Spencer Stone, who play themselves in the film. Vitals: Director: Clint Eastwood. Stars Alek Skarlatos, Anthony Sadler, Spencer Stone, Jenna Fischer, Judy Greer, Jaleel White, Bryce Gheisar, Thomas Lennon, Tony Hale, P.J. Byrne, Sinqua Walls. 2018, CC, MPAA rating: PG-13, 94 min., Drama, Box office gross: $36.250 million, Warner Extras: “Portrait of Courage” behind-the-scenes featurette. Blu-ray adds “Making Every Second Count,” with Spencer Stone, Alek Skarlatos and Anthony Sadler as they take us moment-by-moment through the real-life drama, just as they lived it. Based on Brian Selznick’s critically acclaimed novel. Ben and Rose are children from two different eras who secretly wish their lives were different. In 1977, Ben longs for the father he has never known, while in 1927, Rose dreams of a mysterious actress whose life she chronicles in a scrapbook. When Ben discovers a puzzling clue in his home and Rose reads an enticing headline in the newspaper, both children set out on quests to find what they are missing that unfold with mesmerizing symmetry. 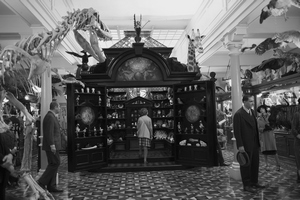 Vitals: Director: Todd Haynes. Stars: Michelle Williams, Julianne Moore, Oakes Fegley, Tom Noonan, Cory Michael Smith, Amy Hargreaves, James Urbaniak. 2017, CC, MPAA rating: PG, 116 min., Drama, Box office gross: $1.060 million, Amazon Studios.